U.S. Fish and Wildlife Service employee checks gill nets on boat. HARLINGEN — The game is cat-and-mouse, and it plays out in freshwater, saltwater and everywhere they meet. Texas Game Wardens swept the Rio Grande last weekend, removing nine gill nets set by commercial fishermen from Mexico. Gill nets, which indiscriminately kill any fish which thrusts its head through the mesh and becomes trapped, are illegal in Texas, but not in Mexico. 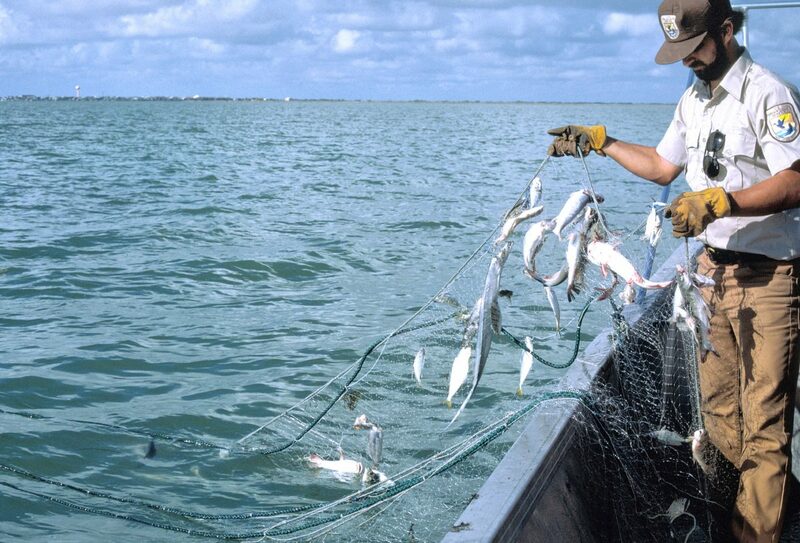 The wardens, from Cameron and Hidalgo counties, say Mexico allows gill nets on the southern side of the river but these nets spanned the river in U.S. waters as well. “During the patrol they came across these gill nets that were extended from one edge of the river to the other,” said Ira Zuniga, public information officer for the Texas Game Wardens. “Normally, half of the river belongs to us, and these commercial fishermen will sometimes extend the nets clear across to our side. “So we know that gill nets are illegal in our waters, so we’ll cut the nets halfway and we’ll take the nets,” he added. Photos released after the patrol show the game wardens with the bow of their boat overflowing with the plastic mesh nets and the floats and weights which keep the gill nets perpendicular to the river’s flow. Michael Gonzalez, a Texas Game Warden in Cameron County, was on the Rio Grande patrol Saturday from the mouth of the river to Brownsville. He said there were two boats with five game wardens, each from both Cameron and Hidalgo counties. “It’s not illegal for them to use that kind of fishing net in Mexico,” he said. “Sometimes we go down the river and we find an abundance of gill nets and sometimes we run up the river and we find an abundance of crab traps. “We know we’re going to find illegal gear when we go up there, and nine is not out of the ordinary,” he added. Gonzalez said the patrol was fortunate to have discovered and removed the illegal nets shortly after they were set. Gill nets can be left in place for days, and the longer they are deployed, the more fish are killed. “The ones on the river we saw mostly were baitfish — some mullet, some baitfish, some crabs,” he said. “There were a couple of turtles, soft-shelled turtles (and) a few snook, some redfish and trout. The river patrol is just one of the venues Texas Game Wardens oversee. Much of their work is found in the Gulf of Mexico, where Mexican fishing boats operate illegally with gill nets and with long lines, both of which are highly indiscriminate in the fish they kill as well as highly lethal. Gonzalez offered an interesting look into how Texas Game Wardens determine where and when to patrol, and what they’re up against. “We’re not going to concentrate on just a single specific area all the time,” he said. “The beauty about being a game warden is we do not have set schedules or set patrol sites, so we can go wherever we see fit at whatever time we see fit. Gonzalez said illegal fishing by commercial fishing boats with home ports in Mexico is a familiar problem for Texas Game Wardens, the U.S. Coast Guard, Homeland Security and Customs and Border Protection, agencies which commonly pool resources to patrol in the gulf. Out in the gulf, target species of the illegal fishing boats are migratory species like shark, Spanish mackerel or king mackerel. The extent of illegal fishing in U.S. waters in the gulf is significant. The U.S. Coast Guard estimated there are more than 1,100 incursions by illegal fishing boats in U.S.-controlled gulf waters annually, with red snapper also a highly-targeted species. “The inshore and the river nets are going to stretch 200 feet roughly depending on how wide the river is,” Gonzalez said, “where an offshore net could stretch out miles. Same thing with a long line. A long line can run like a spider web with one centralized anchoring point and they’ll run six or seven lines off of that in every direction.